The litigious Center for Food Safety two weeks ago filed a rule-making petition with U.S. Department of Agriculture, demanding new regulations prohibiting organic certification of hydroponic agriculture production. The 22-page petition also asks USDA to revoke any existing organic certification previously issued to hydroponic operations. Hydroponic, aquaponic and aeroponic growers currently can earn organic certification. It is allowed by USDA so long as the certifier can show there is compliance with the organic standard. 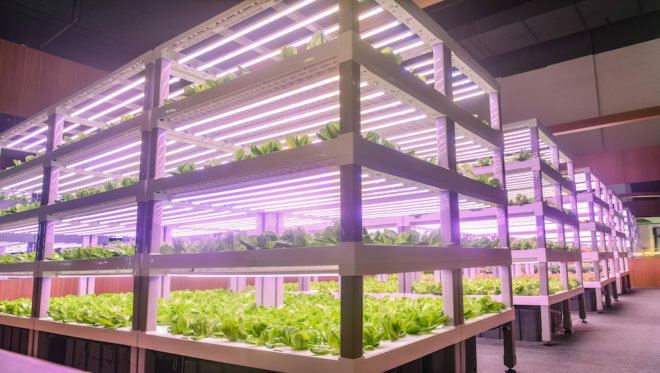 One industry supplier says hydroponics, by definition, is a method of growing plants in a water-based nutrient-rich solution that does not use soil. Instead of plants root in a nutrient solution with access to oxygen. A year ago, USDA’s Agriculture Marketing Service (AMS) tried to settle some issues concerning organic certification of hydroponic and aeroponic growing operations. The AMS action came after USDA’s advisory National Organic Standards Board (NOSB) recommended banning the non-soil systems from being called organic production. USDA only briefly pondered that one before saying “thanks, but no thanks” to NOSB for the recommendation. Aquaponics refers to growing crops in a system with farmed fish that supply nutrients for plants. Greenhouse growers and urban farmers using vertical growing systems use hydroponic and aeroponic methods — all without soil. The organic industry has been rocked with debate about these hydroponic methods for nearly a decade. CFS wants a flat prohibition on hydroponic operations ever being allowed to use the USDA organic label. It claims hydroponic production systems that do not use soil do not meet federal organic standards and violate organic practices, which require that organic farming include soil improvement and biodiversity conservation. Joining the CFS petition are more than a dozen other organic farmers, consumer, retailer, and certifying organizations, including the Organic Farmers Association, Northeast Organic Dairy Producers Alliance (NODPA), PCC Community Markets, and the Cornucopia Institute. “Mislabeling mega-hydroponic operations as ‘organic’ is contrary to the text and basic principles of the organic standard. Right now there is a pitched battle for the future of organic, and we stand with organic farmers and consumers who believe the label must retain its integrity,” said George Kimbrell, CFS legal director. The petitioners say consumers trust the organic label and pay extra for the assurance that it indicates a more healthful and environmentally-friendly way of producing the food they buy. Since the federal Certified Organic label was introduced more than 20 years ago, CFS says the organic food market has grown exponentially and is now a $60 billion industry in which multinational corporations have bought organic brands and compete with small food producers who use environmentally-friendly methods. The petition argues that organic agriculture has traditionally been defined as using soil requirements such as fostering soil fertility, improving soil quality, and using environmentally beneficial farming methods such as proper tillage and crop rotation. USDA continues to allow hydroponics, which goes against the advisory NOSB’s recommendation that organic certification not be extended to the non-soil growing methods. Canada and Mexico prohibit hydroponics for organics, and the European Parliament voted to end the organic certification of hydroponic products in April 2018. The Packer, the produce industry publication, reported Tucker’s comments to the 2019 Global Organic Produce Expo. “There are some certifiers that certify hydroponics, and there are some that do not; they are all bound by a common set of regulations,” Tucker added.